Romanticizing Chores – arts, ink. After writing this poem, I thought to myself, “Do I really romanticize my experiences when I write them down?”. I kept thinking about that question. For some part, it rings true, because I’ve written about things that may seem rather dull to some people, such as the rainy days when I walk back to my apartment soaked, sad and miserable. Yet I write about those rainy days as if every moment of it begs to be noticed. I write as if every raindrop that soaked me had to be felt, deeply or otherwise. The raindrops have to be reflected upon, whether it be the damp sensation of it or what the dampness may mean in the overall context of my life or in the life of others. I jot down the vivid feelings I was feeling at the time and how it may or may not seemingly fit in the present timeline of my life. My thoughts needed an outlet, oh so badly. 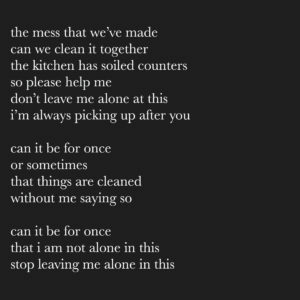 As for this poem, after stress-cleaning the kitchen countertops, I was far from inspired to tackle my bottomless pile of assignments. At this point of the semester, I was in the phase of feverishly writing despite my lurking exams. I needed to make sense of my thoughts through writing while my adrenaline was high. At the end of writing this poem, I wrote down; why am I romanticizing chores? Because I can.